Super Smash Bros. on Wii U and 3DS is the game that keeps giving, assuming you dig into your pocket every now and again. It's rather sneakily become Nintendo's most substantial DLC vehicle to date, serving up over $50 of extra content across four batches if you've opted to buy it all across both versions. It ain't chump change. Ahead of the busy shopping season Nintendo - in North America at least - is bundling most of the goodness together in one package. 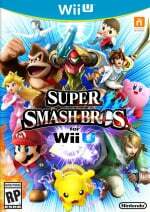 Amazon.com is now listing download packages that include the game and the first three complete DLC Collections; the Wii U version is $99.99 and the 3DS package is $79.99. It's a marginal saving, though it should be pointed out this isn't a great deal for those intending to have both versions of the game, as each DLC pack only offers the content for one platform. Anyone that then buys the same content for the other system will end up paying a lot more than if they buy the game alone and then buy the discounted combo DLC packs for both platforms. Another aspect that strips the appeal from this bundle is the fact that Amazon (and others) are offering physical versions of the game at a nice discount, making it less expensive to buy the disc version and then download the DLC separately. For some this is a valid option, however, and also represents another solid example of a sales partnership with Amazon. Other retailers already sell download codes for some of the packs, though Amazon seems to be first out of the gate with this bundle. Let us know what you think of this offering in the comments. Someone should tell Nintendo how these deluxe editions are supposed to work. @Dr_Corndog this looks like amazon's doing but could be wrong, that being said this would be tempting if I didn't already have mewto. Would of passed on my physical cart to my bro if I didn't have mewtwo. Well..uhm, at least you can buy one of those 1$ games on the eShop?? Well, at least they aren't adding the full $70 for getting the dlc...it's still pricey, but it could be worse. Yeah, that's not how digital bundles are supposed to work one year after launch. Hopefully a proper complete edition will be forthcoming at a reasonable price. A season pass should be $20. 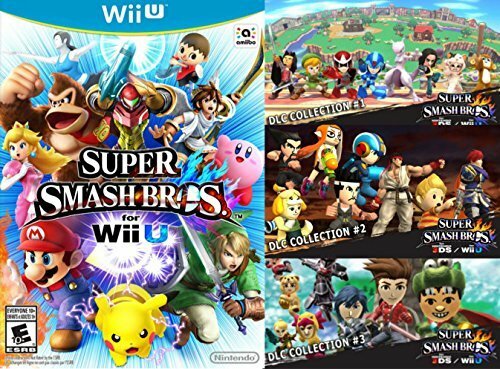 Instead this collection of current DLC is $40 if you consider a digital version of Smash is $60. Way too expensive especially comparing this with the great bargains of DLC for Mario Kart 8 and Hyrule Warriors. I'm a big fan of the GOTY/Complete editions from other publishers. I don't mind waiting for them either. Would be nice if we saw Nintendo do the same. The Smash DLC is hideously over priced, and frankly doesn't really add to the gameplay like the MK8 did. If they give us the disc and carts with all the DLC on it might be more tempting but at the moment I won't bother. The price is too high vs deluxe editions of other games. I'll admit it. One thing that Nintendo does terribly in comparison to its competitors is the pricing of "game deals" or older games. You go to your local target or walmart and find the Nintendo section. Even go as far as looking for an older Wii game. Bet you there is a Nintendo published or developed game for over $50 still. (Edit) And then proceed to the PS3 aisle and see the loads of $20 or below games. Smash is an overly expensive game to begin with. 2 games, Gamecube adapter, Gamecube controller/s, DLC, those 3rd Patry GC controllers skinned around characters, and of course let's not forget it's Amiibo range of over 50 figurines. Eesh. Quite a big price for what should be a sort of deluxe edition. Still hoping for an NX edition with all the content from both versions + DLC to tie people over until Smash 5. I'd be up for an nx special edition with all dlc, but at the same time that's just too many versions of the same game. Daammnn.. That would leave my wallet crying... Good thing I'm not really a fighting game or Smash fan. Has Nintendo forgotten that they have basically nothing this Holiday season?? Running a savings of 2 bucks isn't even worth the effort. Why even bother? They need to be competitive more than ever with the older games to make up for their lack of new ones this season. For shame Nintendo, for shame. The bright and shiny digital future continues to target people who have more disposable money than common sense. But hey, it's not like Nintendo are giving their fans many options about how to spend - might as well burn your cash somewhere. Anyway I think making a GOTY version is a HORRIBLE decision, cause to me, it's saying "You just blew of almost $70!" Nintendo doing what they do best nowadays: completely pointless offers, bundles, etc. that have little to no value and aren't worth their price tag. It's sad that Mario Kart 8's excellence ended up being just an exception, rather than the rule. Smash Bros. is one of my favorite games on both the 3DS and Wii U, but I haven't spent a single cent on DLC for either one. I just find it to be way over priced. One character shouldn't be anymore more than four bucks in my opinion, and it's even worse if you want to own each character on both platforms. The Mario Kart DLC was a steal; Smash Bros. just isn't as good as a value, at least to me. I definitely agree. I can't believe that Nintendo regressed so much after the fantastic MK8 DLC. Coming from someone who bought both versions of Smash, how is that not enough to just give me both characters/stages for each version for 4 bucks?! It's ridiculous. I understand that both versions needed to be made, but I've already forked out 100 bucks to have the privilege of both versions. The least Nintendo could do is just swallow the extra buck. It just comes off as greedy. What I still dont understand is for how long people will accept buying a digital version (same price than retail) for a console where u then have to pay extra for the storage, a dlc pack like this with 2 dollars of saving is like laughing in your face.. its sad, its sad that this is the direction the instrustry is taking..
No super Mario maker or pirate ship? To quote jerry Seinfeld, what's up with that? And don't forget all the amiibos and GC controllers you're going to want. Pretty soon you're going to need to qualify for a load just to play smash. Not a great example of a savings bundle......must try harder Nintendo/Amazon!!! @Sir_JBizzle ahh, you remembered. I have to admit I felt a bit of self satisfaction when I saw the title, thinking, well Nintendo doesn't have any new games worth noticing this holiday, so they finally did a GOTY ed of Smash. $100 wasn't what I had in mind though. And didn't bundle 4 just come up, meaning the DLC is now officially equal to the price of the game? So does anybody remerber Sakuari saying they had no plans for SSB DLC? Ha. Ha ha. Ha ha ha ha ha ha ha, all the way to the bank. What a joke. This just shows what a bad value all that Smash DLC is. As much as I've wanted to play as Ryu and stuff, until the price is right I will refuse to download any Smash DLC. Every bit of DLC released so far for around £10 would be reasonable, I'd say. @HawkeyeWii This is the biggest reason why I have not played Skyward Sword yet. I refuse to pay that much for a game that old, even if it was a new copy. There are too many other games I want to play and I can get more for my dollar by buying them instead. Yikes. They really have no idea how dlc works. I get that nintendo is used to doing new things that might set a trend but seriously, this is were you look at how other companies manage dlc. Id love to see how many people would actually buy this. @Darknyht Skyward Sword is a pretty bad example, because that game is definitely worth full price. This bundle seems especially redundant when considering everyone knows there will be additional content in the not-so-distant future when they reveal the winners of the DLC Characters Ballot. If they are going to make an "offer" like this it would make more sense to wait until they've actually finished with the DLC releases for it. And, you know, actually make some kind of proper discount. Dont care about this pack and i didnt even by everything in the old packs.. Too much bs just sell me the levels and characters and im good. Though i think that all should be free too. I saw this thinking "Oh cool, maybe there will be some nice incentive to get it bundled." Nope. Instead, Nintendo gives meager savings, so why get the bundle to begin with? If you don't care about Mii Fighters (which I'm sure is a modest portion of the community) it's a total waste of cash to grab the costumes. I was impressed by the great deals offered by the Mario Kart 8, Splatoon (it was free dlc lol), and Hyrule Warriors but the Smash DLC is a total rip-off. Thanks goodness Nintendo has the most loyal fan$ in the world. @rjejr: Nintendo consoles may initially cost a little less but they definitively make you pay over the lifetime of the console with their lack of deals. Their profit percentage must be so much higher than Sony's and Microsoft's. By the way. What replaced Club Nintendo? @HawkeyeWii And that sums up the issue why Nintendo never drops price. A four year old game for their last generation console is not worth 60. @Darknyht if it helps, the motion controls in SS annoyed me so much I couldn't finish the game. So you're probably not missing much. @MoonKnight7 @wiggleronacid I feel similarly. I've gotten the three retro stages and all the characters so far, but when I look at the DLC now, I can only see the characters being the furthest I go. When I compare them to the MK8 DLC, they don't seem all that worth it. It doesn't work out too much in my favor, either, since I prefer to have them for tournament reasons. I wish they'd price things a little lower. Total ripoff. The DLC is way too expensive, and doesn't warrant an extra $40. Remember when Sakurai said they weren't going to develop DLC? Zelda fans are probably split about 50/50 for Skyward Sword. I for one am glad that I received the game as a gift instead of wasting my own money on the game. Why would you even want the Mii costumes? One of the few people that got all the DLC for both versions that didn't complain about the price and the tax here makes stuff a bit more expensive. @Yorumi That is an aspect of the game I don't look forward to, but I know enough about it to know that as a fan of the series it is something that I want to experience firsthand. As someone who has defended the price of the Smash Bros. DLC, this "bundle" is a horrible idea. 1. It would be better to wait until all the DLC has been released, whenever that will be. 2. I'd be willing to bet that the majority of Smash Bros. players care little to none about the Mii Fighter costumes (which ARE overpriced). The real value is in the characters and stages. 3. It should retail for much closer to standard MSRP, not double the original game's price. Other companies do this, so Nintendo should be perfectly able to as well. That could potentially drive sales even more, especially during the holidays, because despite the game selling well, there are many Wii U owners who still haven't bought it. @chiefeagle02 They had DLC foe that? Well I can't imagine the characters being good. They already scraped through the barrel and into the dirt with the characters already included in the game. Don't know what everyone's probelm is with Smash DLC. For example: Ryu is $6. This is what you get if you buy him. ...how is that overpriced? People are just penny-penching IMO. @CapeSmash Fighting game dlc tends to be on the expensive side of dlc. You can't always make a direct 1 to 1 comparison to the base game but consider what you'd get for $60 at the dlc price. 10 characters and 10 stages. Ouch that's kind of bare. Or consider something like nslu, which added basically a full game for $20. There's examples of people doing worse but there's also examples of those doing a lot better. Agreed. Its a full fledged Zelda game, and possibly the magnum opus of the Wii and Motion Plus controls. Xenoblade and Metroid Prime Trilogy being some other worthy mentions that really aren't cheap. Sure, it wasn't open world and held your hand. But those were some of the best video game controls I played in my life. I treasure my copy and my gold remote. I'll keep it with the soundtrack even if they put it on Wii U eshop. So obviously you can't directly compare Smash characters to Mario Kart characters, but I think comparing Smash characters to Mario Kart tracks is a pretty fair comparison — they're the main draw of the whole thing and require the most testing and balancing and animation and artwork. $20 to add four characters to a game with 50+ characters vs. $12 to add 16 tracks to a game with 32 tracks — Mario Kart DLC is clearly a way better value. Add on top of that that Smash charges for Mii costumes, which were something you just got for having an amiibo in Mario Kart (and also until tourneys were added, there was no way to use Mii costumes online with strangers, so you couldn't even show off that you bought them). But yeah, the worst part here is that if you buy both of these complete editions, you'll pay significantly more than if you just bought both games at MSRP and then bought all the DLC at the WiiU+3DS bundle pricing. The least they could do is have a double complete pack for about $149.99. No, just no. Maybe it would be a ok deal if the game was still 60 dollars and included all of the over priced as hell DLC, but what the hell is the point of buying this pointless bundle when it won't even include the future DLC from the Smash Ballot and just a small discount over just buying most of the stuff digitally? Get your crap together Sora. @Yorumi You don't need amiibos at all for smash I have several but have used them at most around 10 times each max to make them level 50 but then stopped using them as much due to the fact I bought them for the looks. I'm just waiting for a release date on more DLC characters. The Smash DLC characters are way too expensive. At the end of the support of this game, the DLC will be twice as expensive as the main game but will not even scratch on the content of the main game. Honestly that discount is nearly enough to make me laugh though I guess it is to be expected consider this is Nintendo we are talking about. All things considered I have yet to purchase any dlc thanks to the price being higher than I feel comfortable with paying. If you were to purchase all of the dlc it would likely cost you nearly as much as the full game and considering that there is already an incredible amount of content already in the game it makes the pill that much harder to swallow. After the amazing value that the Mario Kart 8 dlc had this surprises me honestly. Smash DLC is a joke. I got Mewtwo, Lucas and Ryu, and I don't really regret that, but I'm not ecstatic about their prices either. 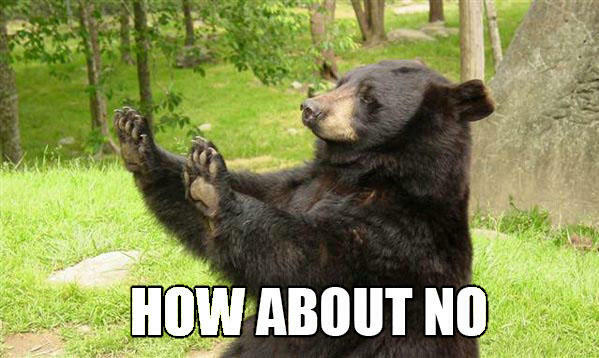 As for the mii outfits, just no. Until they have a sale, no Smash DLC for me. I've bought loads of DLC for other games but the prices are completely unjustified for what you get. The different Mii costumes might as well be horse armour. The prices for the extra characters and stages need to be more in line with the price of the full game, around £1.50/$2 each max.